Expenses – Depends on the value of stamp paper. For example : It is required that a stamp paper of minimum 2.5% of the agreement value (as per the stamp act) should be used in case of property deals or there could be penal implications if/when the document is used as evidence in court . No. of Visits required – 2. Second for the authentication of the agreement from the sub-magistrate’s office/public notary. The buying of stamp paper will take only a few minutes depending upon the queue at the vendor / e-stamp center. At the sub magistrate’s office, time spent depends upon the availability of the magistrate. Preparation time: Drawing the stamp paper agreement is the only time consuming process, which should be done with the professional advice of an attorney (takes 3-4 hours for discussing and drawing the points in the deed), the execution of these agreements will not take more than a few minutes. Total time (from start to end): 7-8 hours in total. A new type of stamp paper called E-stamp have now been introduced by the Stock Holding Corporation and can be their offices. Addresses of sub-magistrates and e-stamp centers across several states can be found HERE (http://tinyurl.com/bcqvp6s). Alternatively, non-judicial stamp papers can be purchased from your local stamp vendor. Below are links to stamp vendors in some major cities in India. Pune: http://tinyurl.com/a7knonw (only destination “A”) For attestment/legalising of the stamp paper agreements, it is desired to approach the magistrate offices . Appointment: No prior appointments are necessary. For a stamp paper agreement, a stamp paper of appropriate value is required. For example :- For most common purposes like rental agreement, affidavit, general agreements, sale agreement (unregistered), the value of stamp duty is usually less than Rs. 500. The only other required document can be (if required by the magistrate) proof of identity forthe parties who are executing the deed for confirmation of Identity. The stamp paper /e-stamp of the required value is procured. After proper advice from service lawyers, a deed between the two parties is drawn. The agreement is then signed by the concerned parties and is authenticated by the sub-magistrate. This makes for a valid stamp paper agreement. The stamp paper is a type of tax collected by the state government. In case of property lease/sell agreements, it is advised to make a stamp paper deed worth at least 2.5% of the value of the agreement to keep its validity intact. It is required that the stamp paper be purchased in the name of one of the parties to the instrument/document. It must be purchased in the name of one of the parties involved in the transaction. The stamp paper agreement can be sent to the NRI’s to their respective addresses for signatures. The person can always add a notarized or apostilled (for US) copy stating that these are his/her signatures. There are several companies like “superseva”, who provide services such as providing e-stamping and franking services (link given in references) which are helpful for people who want to get a homemade agreement. Stamp papers are always purchased in the name of one of the parties involved in the transaction. 1. 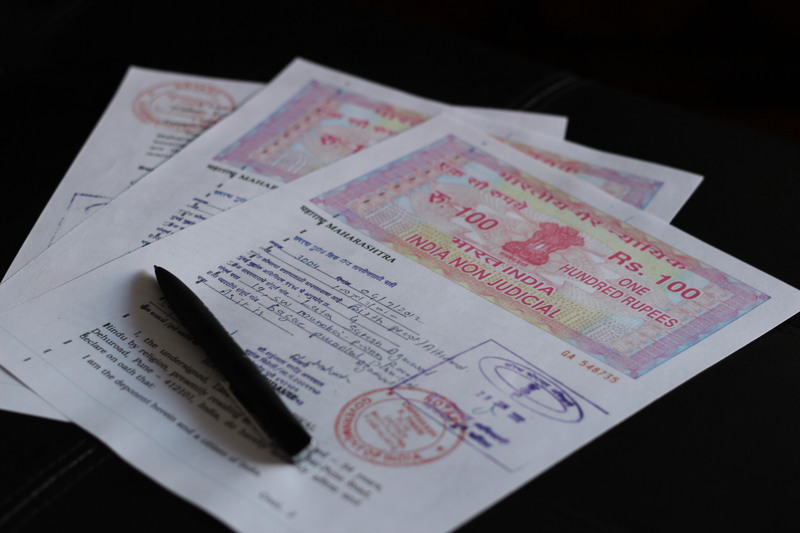 Aperson wants to sell a property in India and is asking if the stamp paper agreement is to be signed in physical presence of the person, or can it be couriered, signed and sent back and still counted as valid. 2. Person has entered into an agreement effective from before the date of stamp paper date and needs guidance whether the same is valid. 3. The concerned person wants to renew his rent agreement.